With the fall sports season almost in the books, the careers of several seniors have come to a close in terms of athletics. For the Minford Falcons, that narrative is no different. 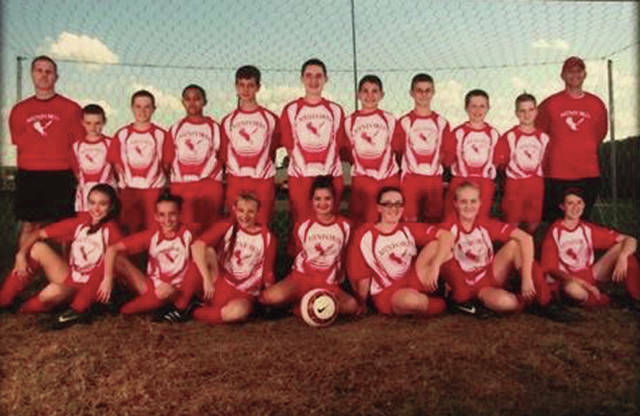 The boys and girls soccer team had a combined 13 seniors on their roster this season, a group of kids who stuck together from peewee soccer throughout high school. Along the way, soccer skills sharpened and new friendships were built. Those relationships carried on to high school, and now those seniors are just several months away from graduation. Still, they are proud of what their school and teams mean to them. Over the years, each player learned a lot about one another both on and off the pitch, and it played a factor on the field. Through trials and tribulations in soccer, a lot of lessons were taught along the way. Elijah Craft felt the same about the team working together, and expanded on that idea. Those relationships formed on the field extended beyond the sport, and into the lives of each athlete. “We had great bonding between everybody, and it made us stronger as people,” Jacob Smith said. Though some may not have soccer to look forward to anymore, they’ll still have each other. All in all, the seniors were around to share a lot of success with each other over time. As freshman, both the boys and the girls team won the SOC. That moment was one to be cherished and remembered for many of the aforementioned Minford Falcons. Eli Cordle recalls those matches as a freshman, but enjoys a more recent memory from his team. “I really enjoyed beating Wheelersburg on their own field last year and winning SOC,” Cordle said. For others like Craft, the memories were of a more humorous variety. All of the seniors laughed reflecting on Craft’s moment, although he seemed to still be a bit curious about if the penalty was warranted. Of course on any team, you have the personalities that make up more than just what happens in a game or at practice. The Falcons seniors are no different with the characters they have on their roster. “Jacob is our moral support guy,” Boston said. Craft added “he’s the one that cracks the jokes” and said that Smith has the dankest memes on the team. The girl’s team had that same camaraderie, according to Marissa Watters. Though there is a lot to be missed about their time together, there were several different answers when it came to what would be missed most specifically. “I think I speak for everybody, we’ll probably miss the team breakfasts,” Watters said. That comment struck in a smile in Daniel’s face, who reminisced on all those occasions of eating together as a team. Daniels loved those meals with her team, but will miss a different feeling on the field. Craft will also miss a peculiar part of the pitch.“Playing underneath the lights at our home field” is what Craft said he would miss the most. As could be expected, the teams have had a lot of competition amongst one another over the years, and even against each other. The girls, however, say they have always dominated the boys. That competitive spirit even bled over into some other sports. When asked to defend themselves, the boys had little to offer. “It’s not worth it anymore,” Boston said. All those games against each other really helped the girls get tougher on the field, according to Daniels. Of course, there wasn’t always positive experiences together at the time. Looking back, though, it helped mold each player into the person they are today. Risner’s comments prompted some repressed memories from Daniels. Craft wasn’t a big fan of “Dewey Time” either. “He made it sound fun, but it wasn’t,” Craft said. As a team, the seniors came together one last time last week for their annual soccer banquet. 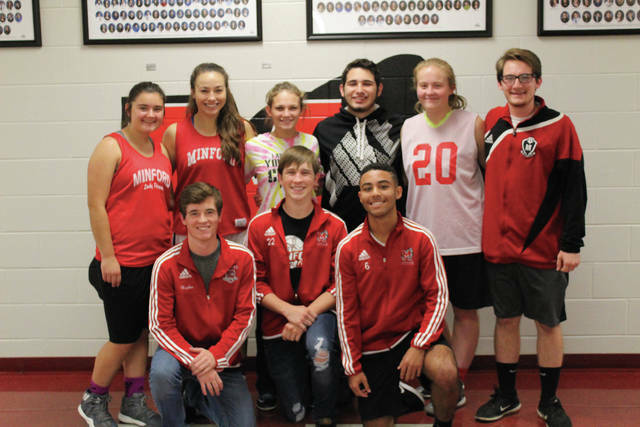 Some will still be seen on the basketball court this year for Minford, but for others it was the last time as a Falcons athlete. With their high school lives winding down, the seniors have already thought long and hard about what their futures hold. Higbee is one of several Minford soccer seniors who say they hope to continue their education at Shawnee State. Aspen Lambert hopes to become a Bear and get her masters in occupational therapy. Boston, Cordle, and Smith also hope to attend SSU. Watters is going to Ohio University in Ironton to become a teacher, and Risner is going to Ohio University in Athens to become a speech therapist. Risner really hopes she is able to work in special education. Daniels committed to play basketball at Ashland University, and is studying education with hopes of becoming a teacher. Craft is still undecided, but will play college soccer somewhere. 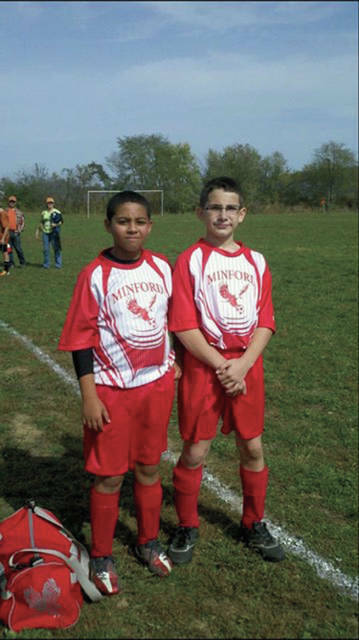 While times change and people change over the years, one thing is for sure with this group of seniors: They will always be Minford Falcons, and will represent their school with a ton of pride, just as they did throughout their years together.